The debt of Jeff Perren and Gary Gygax's mass combat rules in Chainmail to Tony Bath's medieval system has long been documented, so it should be no surprise that the man-to-man system borrows from another UK source. As 1966 was the 900th anniversary of the Battle of Hastings, Donald Featherstone made the theme for Wargamer's Newsletter #51 the medieval setting. 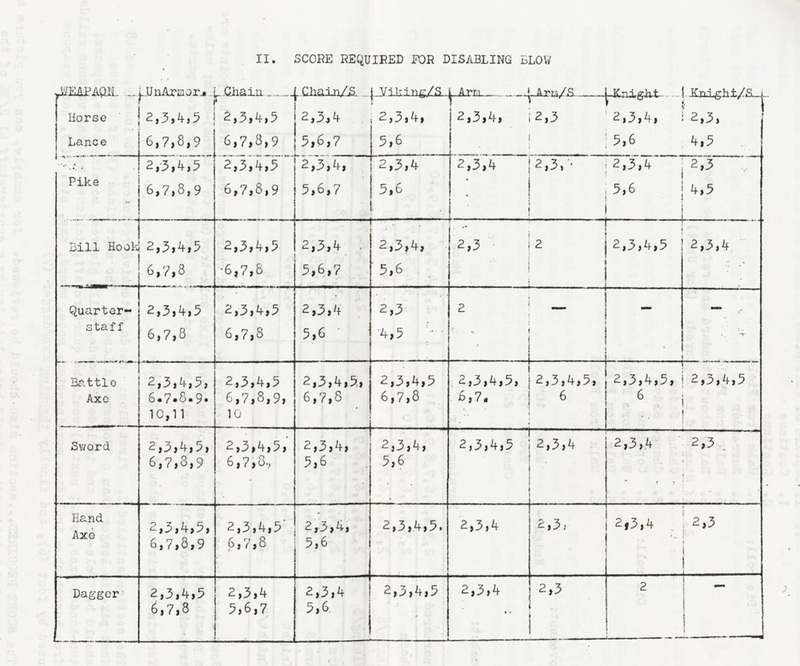 Phil Barker's contribution to that issue featured a number of elements that prefigure the "U.N. Owen" rules in Domesday Book #7 -- including a simpler to-hit chart for weapons versus armor types. As the values here suggest, attackers rolled only a single six-sided die against Barker's original medieval to-hit chart. When "U.N. Owen" revised these rules for the Domesday Book, the four classes of armor became eight, and the four groupings of weapon types grew to eight (ten, actually: a separate table covers maces and morning stars), and instead of rolling to hit with one d6, players would roll two. But the core idea of a medieval weapon versus armor to-hit chart for individual figure scale combat where a hit is scored by rolling high is crystal clear in Barker's original. It was hardly unusual that Gygax could not identify a source for these rules: in the open and collaborative environment of miniature wargaming, rules often became detached from their original authors. 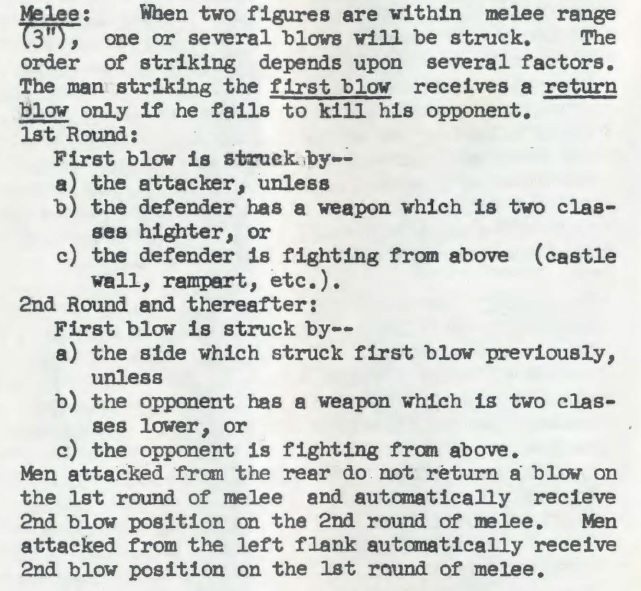 Don Featherstone himself, in his 1969 Advanced War Games, gives a version of Phil Barker's medieval rules (see p.86-87) including this to-hit chart, as well as incorporating some of Barker's later material in Wargamer's Newsletter #55 -- without any clear credit to Barker. 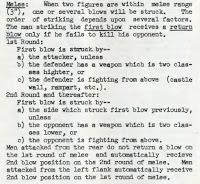 From Advanced War Games, which was widely read at the time, any number of people might have picked up and adapted the rules, even in multiple iterations by different contributors. 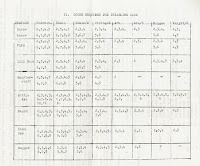 In other cases, the "U.N. Owen" reviser of Barker's rules has introduced more substantial changes, as in the initiative sequence, where "U.N. Owen" kept only three of the six factors in Barker's rules. Already in his commentary on the ordered "longest weapon" list in Domesday Book #7, Gygax has begun reordering them into the order of weapon class in Chainmail. How "U.N. Owen's" three factors evolved into the initiative system (a, b, and c) of Chainmail from there is fairly straightforward. We also know that some elements of Barker's rules did not make it into the "U.N. Owen" system. Gygax observes that "some missile rules are needed" as none appear in the Domesday Book article, but Barker had supplied rules for archers in his original Wargamer's Newsletter #51 piece that "U.N. Owen" seems to have lost. Gygax also disagreed quite forcefully with the to-hit scores that "U.N. Owen" recommended, incredulously demanding, as if this were a well-studied matter, "Can you picture a chain-mailed knight with a shield being laid low by a quarterstaff 41 2/3% of the time?!" He invited subscribers to the Domesday Book to "work up a revised table" for a future issue:, presumably along the lines of the one that would appear in Chainmail. It has been remarked that Chainmail is something of a grab bag of isolated systems: a mass-combat wargame, a man-to-man skirmish level game, a jousting mechanism, and a set of fantasy combat rules. As we uncover more inspirations for these subsystems, like Leonard Patt's work for the fantasy system, we understand why the parts of Chainmail are so disjoint: each derived from different influences in the creative commons of miniature wargaming, and although Gygax adapted and anthologized them, little effort was made to reconcile or interwork them. One might say something similar about the way that Chainmail and the "alternative combat system" are presented in Dungeons & Dragons. Awesome. I've been wanting to see that table from Domesday #7 for quite a while. And you have traced it back to its roots! The armour types in WGNL#51 are the same as those used by Tony Bath, with the addition of "full armour"
Chainmail uses the same armour types for missile fire, but is missing "1/2 armour & shield"
These categories are used nowhere else in Chainmail. Are the parry rules present in "U.N. Owen's"?